Yale has built up a significant collection of materials related to Japanese film and media. This is a guide to reference and other materials in Japanese in the Yale University Libraries that are useful in the study of cinema in Japan. In part due to the lack of institutional support for film studies in Japan, research on Japanese cinema still suffers from the absence of systematic and comprehensive reference materials, such as complete filmographies, periodical indexes, and biographical dictionaries. While there have been many reference works published in Japanese, they are often incomplete and require the researcher to navigate through a maze of different resources even when pursuing a simple topic. 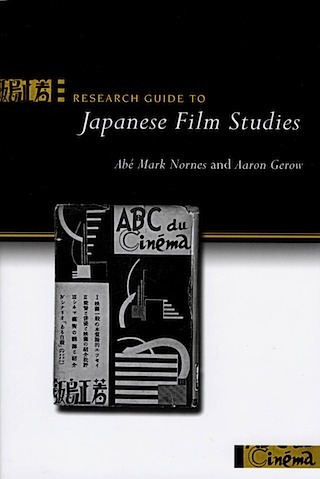 The best guide to those resources is Research Guide to Japanese Film Studies, which I co-wrote with Abé Mark Nornes and which was published in 2009 by the Center for Japanese Studies at the University of Michigan. It contains an annotated guide not only to bibliographic resources but also to the major archives and libraries useful for studying Japanese film. A Japanese translation, which includes updates and new entries, was published in 2016. This online guide is not a substitute for those essential works, but rather presents some of the major materials with minimal annotation, with a focus on materials available at Yale. It also offers links to online resources. Items are generally arranged in alphabetical order by title, though similar items may be grouped together. When appropriate, I have starred (*) important works. Links to the book's record in Orbis have been supplied when possible, though with some multi-volume series, it is only to the first volume in that collection.